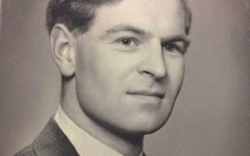 Christopher Morris born 13th May 1922 lived in Clevedon and joined HCS as a chorister in 1932 from Wyecliffe Prep School. He rec'd the Sinclair scholarship in 1936. During his time at the School, he sung under Elgar in 1933 with the LSO. He left the school in the summer of 1937 having gained his Oxford School Cert. He served in WW2 and then attended Royal Academy of Music. "Christopher Morris -A former Head Chorister of Hereford Cathedral, a brilliant choir-trainer and musicologist, who retired after twenty-five years of service." He also worked at Oxford University Music Press and was responsible for the publication of "Carols for Choirs" a work that is attributed with changing the way we hear Christmas today. He is also responsible for the first publication of John Rutter's work Shepherd's Piper. His grandchildren are all choristers, his son Paul reports. Christopher died on 24th November 2014 aged 92 years. His son and John Rutter spoke about Christopher Morris on BBC Radio 4's programme "The Last Word"